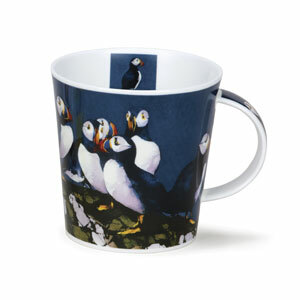 Scottish Puffins decorate this oversized mug. Beautifully reproduced watercolor painting with colorful puffins on the Scottish shoreline wraps around the mug, This handsome extra-large mug is made of bone china in the UK, holds 16.2 oz. of coffee, tea or whatever you put in your mug and stands 4.25 inches tall and 4 inches in diameter. Heirloom quality, perfect for wedding presents and shower gifts. Made by Dunoon Pottery, known for quality decorated drinking vessels - mug is really not the right word! Dunoon is a thriving family business which began manufacturing the highest quality mugs in 1974 when the company was formed by two former executives of Staffordshire Potteries Ltd, Gordon Smith and Bill Harvey, both of whom were committed to the concept of producing quality ranges of stoneware mugs, filling a gap in the market with user friendly, beautifully designed original mugs. recruited and production began. Dunoon was soon selling mugs globally to quality retailers worldwide. numerous designers and artists to constantly update its ranges with new designs and unique mug shapes in both Stoneware and Fine Bone China. Dunoon uses slip casting to guarantee a fine, lightweight mug; a method still used today. 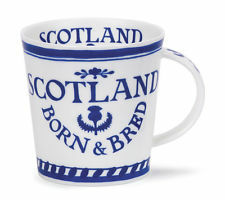 Dunoon is very loyal to its Scottish roots producing ranges dedicated to Scottish themes and customers. The growth in popularity of speciality coffee and teas has led to increasing sales and demand for both finer quality and unusual mug design.